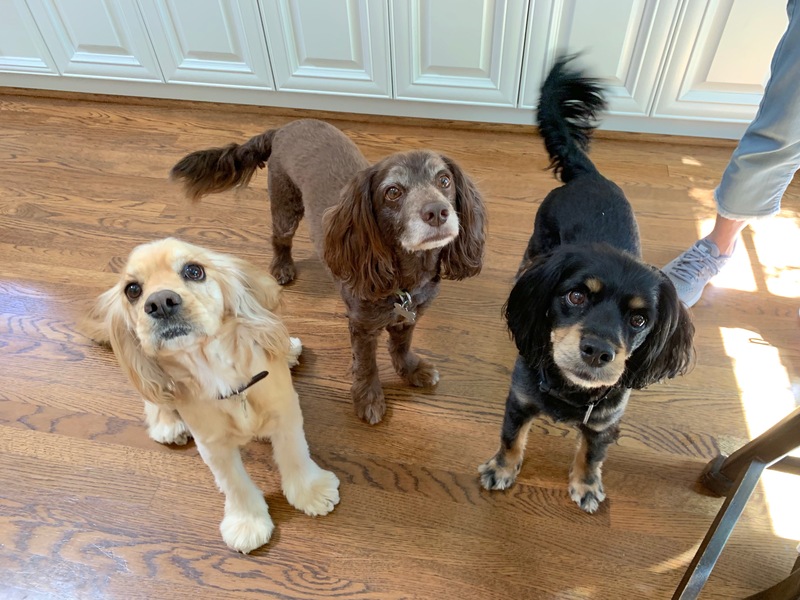 For this Santa Monica dog training session, we share a ton of dog behavior tips to help a trio of rescue Cocker Spaniels (from left; Mini, Bailey and Monty) stop barking, behave at the door and listen to their guardian. The dogs were pretty excited and did a lot of barking when I first arrived for this Santa Monica in home dog training session. Stopping dog barking was one of the top items on the dog’s guardian’s agenda. Monty and Bailey barked a bit during the greeting, but stopped once we sat down to chat. Not Mini, she barked and barked and barked. Some of this was alerting but a large portion was what we call Demand Barking. She was also jumping up, nudging for attention and racing around the room. After 15 minutes of this, it was obvious that Mini needed some exercise so I showed her guardian a creative way to exercise a dog inside. While increasing Mini’s daily exercise is a very important part of her behavior modification, there were other issues at hand too. One of these was being underfoot. To help with this dog behavior problem I showed the guardian how to train a dog to leave a room on command. Another dog behavior tip I shared was what I like to call Petting with a purpose, this is probably the simplest thing any dog guardian can do to help a dog start to see and respect the humans as authority figures and motivate them to offer desired behaviors. Unfortunately there was a corruption of the video file we shot in the session, so I added a video from our puppy classes on this positive dog training approach. An offshoot of Petting with a Purpose is to pet or give attention any time the dog voluntarily does something you want it to do. I call this Passive training and I explain how it works in the video below. Another way to add structure and help dogs see humans as leaders is to introduce and consistently enforce rules. I go over how this works and suggest some rules in the following video. Another dog behaviorist trick I shared was how to teach a dog to focus on a human on command. I call this a focus exercise and detail how it works in the following free dog training video. Teaching a dog to focus on command isnt hard, but it takes some practice. Id like to see the guardian practicing this with each dog at least once a day (more is better) until she gets to a 15 second focus before moving on to the next step. If she follows the instructions I provided, it shouldn’t take long before these dogs focus works for the guardian instead of against it. To help the guardian more effectively disagree with the dogs when they are doing things the guardian doesn’t like, I went over the escalating consequences I came up with a few years ago. The second the third consequence are based on how dogs communicate with each other so most dogs pick it up right away. This trio was no exception. One of the times the dogs act in a way the guardian doesnt like is when people come to the door. We shot a video that shows how to use classical conditioning to teach a dog to move away from the door when it hears the door bell, but that video got corrupted as well. Below is a video of the technique I filmed with another guardian. This is the best approach to stop dogs from rushing the door when people arrive. But in the mean time, the guardian may need to accomplish this before the dogs are fully trained to move away from the sound of the door bell. In the video below I showed the guardian how to claim the area around the door and use body language to move them away. Id recommend the guardian enlist the help of a few friends and neighbors to help her practice this claiming the door exercise until the dogs understand and move away easily. This way the guardian can practice without the pressure of being a good guest and letting people inside right away. Another thing the guardian wanted to work on was the dog’s behavior on walks. I showed the guardian how to add a special twist of the leash when using a Martingale collar and recorded it so you can watch it too. Because we took our time while leashing the dogs up and provided them leadership and timely corrections, it didn’t take long for the dogs to stop their pulling and instead started walking next to the guardians nicely. When the guardian said she couldn’t remember the last time the dogs behaved so well on a walk, I knew we were making good progress. And this proves you don’t have to be a professional Cocker Spaniel dog trainer to have well behaved rescue dogs. These dogs all have various issues and since there are three of them, the guardian will need to put in some work. But now that she has the techniques and dog behavior knowledge she needs, she can start rehabilitating her dog’s unwanted behaviors. The demand barking will likely get worse at first, but as the guardian practices the new exercise more frequently, enforces rules consistently and starts rewarding desired behaviors instead of those she doesnt like, it should get progressivly better from here on out. To help the guardian remember all the things we covered, I summed up this Santa Monica in home dog behavior session with a short roadmap to success video.